RYAN LEE is pleased to announce Shadows We Run For, an exhibition of new work by British artist Christopher Cook. For more than a decade, Cook has used liquid graphite, a medium he developed that combines graphite powder, resin and other solvents. His technique lends itself to a range of mark-making, from the rapid and improvisational to the nely detailed, and when applied to coated paper, it results in a fusion of drawing and painting. ough working in grayscale, Cook achieves remarkable luminosity and textural variation in his paintings. 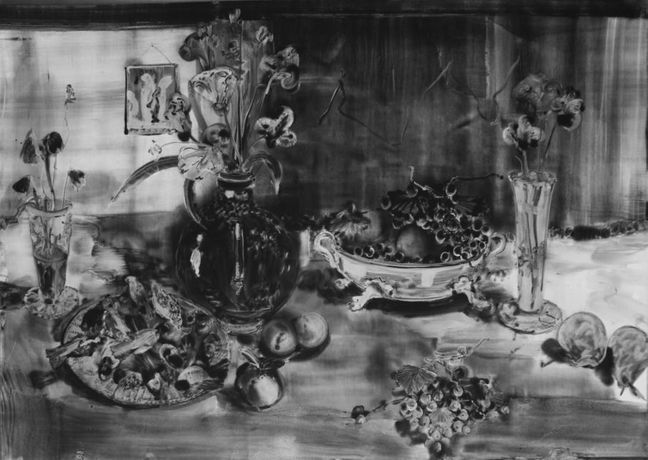 In Euro ghter (2017), a table arranged with luscious fruit, fresh owers and sparkling glassware is disrupted by the intrusion of two ghter jets speeding across the picture plane. Gleaming grapes and a crystal vase serve as counterpoints to the matte metal aircra s, while other bits of fruit and owers sit precariously on the table’s edge or dri into the background. e dynamism of the scene re ects Cook’s process: because the liquid graphite dries quickly, he has a limited amount of time to revise the imagery as it develops. He negotiates with the medium, adding pigment and wiping away until the composition is resolved. While Cook’s omission of color may make the intentional anachronism of Euro ghter’s elements less jarring, it throws an unsettling imperialist impulse into relief.